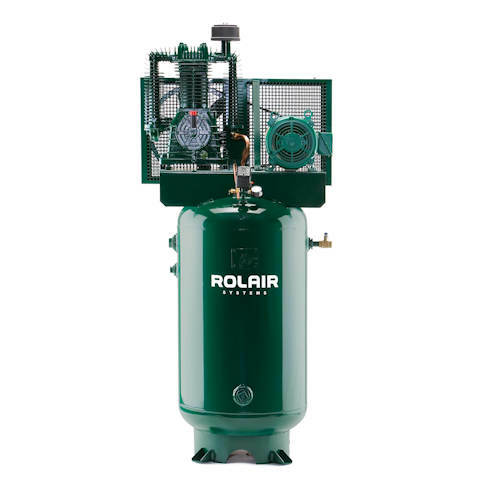 7.5 HP, two-stage electric stationary air compressors on a variety of tank configurations. Model V75380K50 shown. Click to view all models in this category. Optional Equipment: Magnetic Starter, Automatic Tank Drain, Low Oil Shut Down, Vibration Pads, Dual Controls, Head Unloader, Refrigerant Air Dryer, Air-Cooled Aftercooler. Two-Stage, Cast-Iron Cylinders, Aluminum Head and Crankcase for Faster Heat Dissipation, Ball Bearings, Splash Lubricated, Bearing Inserts on Connecting Rods, Swedish Lamellar Reed Valves, Oil Sight Gauge, Low RPMs to Ensure Long Life and Trouble-Free Performance. H75160K30 7.5 Single 60 Gallons, Horizontal 1740 32.3 @ 175 PSI 23.5 @ 175 PSI 52" 20" 49" 512 lb. V75180K30 7.5 Single 80 Gallons, Vertical 1740 32.3 @ 175 PSI 23.5 @ 175 PSI 30" 24" 77" 562 lb. H75112K30 7.5 Single 120 Gallons, Horizontal 1740 32.3 @ 175 PSI 23.5 @ 175 PSI 72" 30" 53" 682 lb. V75112K30 7.5 Single 120 Gallons, Vertical 1740 32.3 @ 175 PSI 23.5 @ 175 PSI 40" 30" 74" 697 lb. H75360K30 7.5 Three 60 Gallons, Horizontal 1740 32.3 @ 175 PSI 23.5 @ 175 PSI 52" 20" 49" 507 lb. V75380K30 7.5 Three 80 Gallons, Vertical 1740 32.3 @ 175 PSI 23.5 @ 175 PSI 30" 24" 77" 557 lb. H75312K30 7.5 Three 120 Gallons, Horizontal 1740 32.3 @ 175 PSI 23.5 @ 175 PSI 72" 30" 53" 677 lb. V75312K30 7.5 Three 120 Gallons, Vertical 1740 32.3 @ 175 PSI 23.5 @ 175 PSI 40" 30" 74" 692 lb. H75160K50 7.5 Single 60 Gallons, Horizontal 1740 30.4 @ 175 PSI 23.7 @ 175 PSI 52" 26" 52" 580 lb. V75180K50 7.5 Single 80 Gallons, Vertical 1740 30.4 @ 175 PSI 23.7 @ 175 PSI 30" 26" 80" 630 lb. H75112K50 7.5 Single 120 Gallons, Horizontal 1740 30.4 @ 175 PSI 23.7 @ 175 PSI 72" 30" 56" 750 lb. V75112K50 7.5 Single 120 Gallons, Vertical 1740 30.4 @ 175 PSI 23.7 @ 175 PSI 40" 32" 77" 765 lb. H75360K50 7.5 Three 60 Gallons, Horizontal 1740 30.4 @ 175 PSI 23.7 @ 175 PSI 52" 26" 52" 575 lb. V75380K50 7.5 Three 80 Gallons, Vertical 1740 30.4 @ 175 PSI 23.7 @ 175 PSI 30" 26" 80" 625 lb. H75312K50 7.5 Three 120 Gallons, Horizontal 1740 30.4 @ 175 PSI 23.7 @ 175 PSI 72" 30" 56" 750 lb. V75312K50 7.5 Three 120 Gallons, Vertical 1740 30.4 @ 175 PSI 23.7 @ 175 PSI 40" 32" 77" 760 lb.